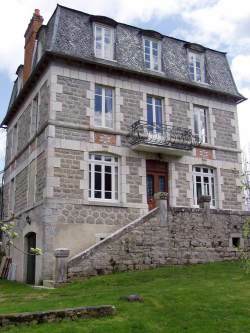 A drive through the large gates brings you to the house which stands in an elevated position in a 1/2 acre with stunning views of the Lot river and the surrounding gorge du Lot. From all rooms there are tranquil views of the surrounding countryside and from rooms at the front of the house, views of the Lot river. Outside, there is a large terrace to catch the sun and a covered area ideal for dining al fresco on the wonderful food this region provides. The village of Entraygues sur Truyere is a 10 minute walk away. It is also a town of numerous Medieval vestiges with its superb "colombage" (exposed beams with masonry fill) houses dating from the 15th to the 17th centuries, its castle and 13th century bridges. It is a thriving and friendly community with many small shops, boulangerie, a bank, post office, restaurants, hairdressers and cinema. Entraygues-sur-Truyere is a wonderful place to stop and explore all the Aveyron has to offer. 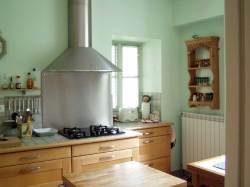 The Aveyron is one of the most charming and unspoiled departments of southwest France. Rich in history, this is a land of cathedrals and abbeys, magnificent castles and fortified towns. Home of the Knights Templar, the countryside abounds with stark reminders of turbulent times in medieval France. The region is also renowned for its gastronomic delights - from farmers markets, country auberges and grand restaurants the region is a never ending temptation at whatever level you choose to explore. 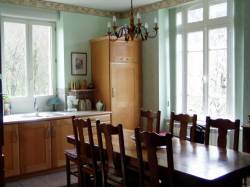 The house is located only 1 hour from Rodez airport.